Posted on Tue, Jan 24, 2012 : 1:46 p.m.
Steve Robb, who coached the Milan High School football team for 25 years, is the new coach at Dearborn Divine Child. 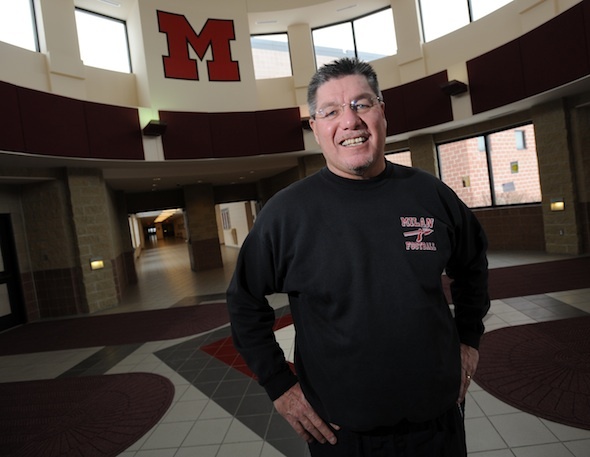 Longtime Milan High School football coach Steve Robb’s retirement didn’t last long. Robb accepted the head coaching position at Dearborn Divine Child last Friday, less than a year after stepping down at Milan, where he coached for 25 years. Robb was introduced to the student body at an assembly covered by the Dearborn Press and Guide on Monday. Robb told AnnArbor.com shortly after resigning at Milan that the offseason demands were beginning to be too much of a burden and that he wanted to spend more time at home with his sixth-grade son, Joey, and daughter Kylie, a sophomore at Plymouth High School. "I found a little bit that as they’re growing they don’t need dad at home as much," said Robb who ended up being an assistant coach at Canton High School last season. "I kind of surprised myself there. ... It rekindled my excitement." Robb was contacted on Dec. 1 about the job at Divine Child, where he was an assistant coach from 1981-85. He was part of the Falcons' 1985 Class B state championship and a 1982 runner-up finish. "At first we talked and agreed not to pursue it, we negotiated for six or seven weeks," Robb said. "In the long run, they made me an offer I couldn’t refuse." Robb said the fact that Divine Child's campus is less than 20 minutes from his home in Canton made the job all the more appealing. Robb will continue as a physical education teacher at Milan High School. "That’ll be an interesting. ... The logistics have yet to be worked out," Robb said. Robb had a 163-82 record with 19 winning seasons and 12 playoff appearances at Milan. His teams had back-to-back undefeated regular seasons in 1996 and 1997, and advanced to the quarterfinal round of the state playoffs in 2000 and 2007. Tue, Jan 24, 2012 : 7:42 p.m.
First jello wrestling, now this........ Milan, R.I.P.